Is there demand from European tour operators for sustainable tourism suppliers in developing countries? Europe is one of the largest source markets for trips to developing countries. European tour operators, especially in Northern and Western Europe, increasingly focus on working with sustainable suppliers. To increase their chances on the EU market, tourism businesses in DCs are therefore recommended to implement sustainable practices. The main sustainability requirements of EU tour operators include a sustainability policy, decent working conditions, poverty reduction, conservation of natural and cultural heritage and competitiveness. Although most tour operators do not require sustainability certification yet, it is expected to become more important over the next few years. Which European markets offer opportunities for sustainable tourism? Which trends offer opportunities on the European market for sustainable tourism? Which requirements should sustainable tourism comply with to be allowed on the European market? What competition do you face on the European market for sustainable tourism? Through which channels can you get your sustainable tourism products on the European market? What are the end-market prices for sustainable tourism products? “tourism that takes full account of its current and future environmental, social and economic impacts, addressing the needs of visitors, the industry, the environment and communities”. As such, sustainable tourism aims to retain the economic and social advantages of tourism development, while minimising undesirable impacts on the natural, historic, cultural or social environment. Sustainable tourism makes optimal use of environmental resources. It strives to maintain essential ecological processes and conserve natural heritage and biodiversity. Sustainable tourism respects the authentic culture of host communities, and conserves their cultural heritage and traditional values. It aims to contribute to understanding and tolerance between cultures. Another important aspect of sustainable tourism is to ensure viable, long-term economic operations. This process should provide benefits to all stakeholders, which must be fairly distributed; for example, through stable employment and income-earning opportunities for local communities, as well as the establishment of social services. By following these principles, sustainable tourism contributes to poverty alleviation. Sustainable tourism is not a separate component of tourism or a niche market, but it is an increasingly important aspect of the tourism sector as a whole. In fact, sustainability is becoming the norm for the industry in Europe. On this market, sustainable tourism certification can give you a competitive advantage. Originally, certification programmes for sustainable tourism mainly focused on accommodation. Nowadays, their scope is expanding to include agents and providers of activities, for example. There are more than 150 sustainable and/or green tourism labels worldwide. This variety can cause confusion among tour operators and travellers. For more globally recognised certification programmes, see the Global Sustainable Tourism Council (GSTC). Find out whether your country or region has its own sustainable tourism certification programme; for example, via Tourism 2030. Determine your ability to comply with the requirements of important sustainability labels. Only apply for certification when compliance is feasible. Bear in mind that a certification process can take 1–2 years, especially if your business is not certification ready. Applying for certification can be costly, so research the possibilities for assistance. Non-governmental organisations (NGOs), multilateral agencies (such as the European Union or Development Banks), governments or even European tour operators may offer technical assistance or subsidise certification costs. More than 1 in 10 European travellers book sustainable holidays. These sustainable travellers are generally higher-educated, well-travelled people of all ages from higher socioeconomic groups. They mainly come from more mature travel markets in northern and western Europe. This group is a relatively small segment, with a strong focus on sustainability. These travellers have high expectations. They are especially cautious of so-called “greenwashing”, promoting a tourism product as more environmentally friendly than it actually is. To target this segment, make sure that you can support any claims which you make about your sustainable practices; for example, by applying for sustainable tourism certification. This group is the largest segment, with the most growth potential. These travellers are not necessarily very knowledgeable about sustainable tourism, but they prefer it because they associate it with doing “the right thing”. They rely on tour operators to provide these types of holidays. In fact, 66% of European travellers believe that the responsibility for sustainable travel primarily lies with travel companies. To target this segment, cooperate with tour operators in your European target market(s). Ask them about their customers’ profile and preferences, and adapt your products accordingly. 3 . Which European markets offer opportunities for sustainable tourism? Although the exact demand for sustainable holidays is difficult to measure, 46% of travellers already consider themselves a sustainable traveller. However, only 5% think travelling sustainably is easy. This figure explains why 11% of European travellers actually book sustainable holidays and 55% would like to have more information and more of a choice. Interest is rising, as the intention to book sustainable accommodation has doubled in 2017 to 65% worldwide. Obviously, sustainable tourism has tremendous potential. Clearly communicate your sustainable practices in your marketing and to your partners within Europe. If you have sustainable tourism certification, prominently place the logo of the programme on your website and brochures. If you are a new entrant on the European market for long-haul tourism, directly include the sustainability component in your tourism product. This strategy will increase your chance of success considerably. Travellers and tour operators in northern and western European countries are the most concerned with sustainability. 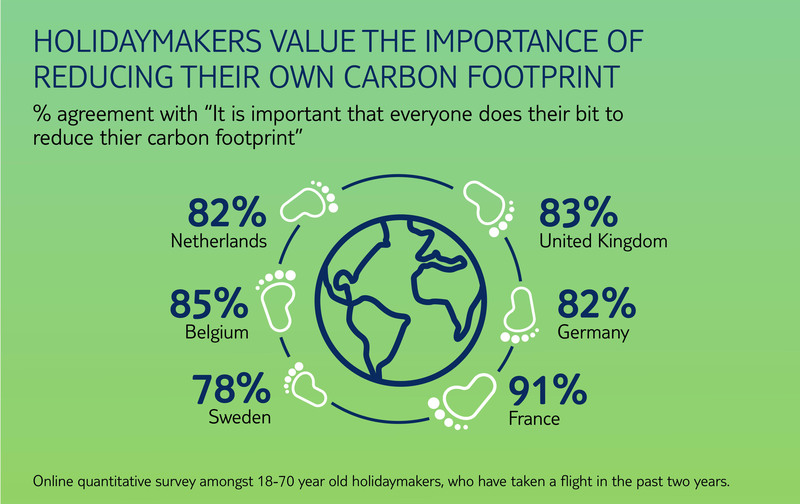 For example, 80–90% of northern and western European travellers think that everyone should strive to reduce the CO2 footprint of their trip. These countries also score the highest on travel and tourism policies and factors that enhance environmental sustainability. They score an average of 5.1 out of 7, almost 2 points higher than the rest of Europe and 2.5 points higher than the USA. This figure reflects the commitment of northern and western European countries to sustainable tourism. For example, the Dutch government and travel industry stakeholders are stimulating sustainability in the sector via their Green Deal on Sustainable Tourism. To work with tour operators in northern and western Europe, you need a strong sustainability performance. Vice versa, if you provide sustainable tourism products, northern and western European countries are promising target markets. For more information on European traveller numbers in general, see our study of European demand for tourism in developing countries. 4 . Which trends offer opportunities on the European market for sustainable tourism? European tour operators increasingly select their suppliers based on sustainability certification. Especially in the United Kingdom, the Netherlands and Germany, certification is set to become a mainstream requirement. For example, the large tour operator TUI has a Sustainability Strategy – Better Holidays, Better World 2020. This strategy states that by 2020, TUI’s accommodation partners must have obtained GSTC-acknowledged sustainability certification. Research which sustainability certification your target tour operators in Europe require; determine whether complying with the certification programme is feasible to your company. If you are certified, use the logo in your marketing; for example, on your homepage. Online reviews and feedback have become important sources of information on the sustainability of tourism providers. Travellers frequently share their experiences on social media platforms, travel review sites and travel blogs. This information can alert other travellers and tour operators to outstanding sustainability performances, as well as to businesses that make bogus claims about their sustainability (“greenwashing”). Review website TripAdvisor already uses its GreenLeaders programme to showcase sustainable providers. It gives travellers a list of sustainable practices to check before booking. They can also provide feedback on these green practices after their trip. Presently, a European initiative is asking Tripadvisor to add sustainability to its rating criteria. This development would allow travellers to rank providers according to their rated sustainability performance as well. Make sure that your claims about your sustainability performance are honest and realistic. Monitor what guests say about your company and its sustainability on social media, review websites and blog. Use these insights to improve your policy and performance. Encourage customers and partners to share their experiences through social media, review websites and blogs. This activity allows them to act as ambassadors for your company. If possible, apply to become a GreenLeader on TripAdvisor. After having been primarily focused on individual tourism businesses, sustainability is now expanding to entire tourism destinations. Destinations increasingly strive to create an image for themselves as sustainable frontrunners. Destinations in developing countries with a good sustainability reputation include Costa Rica, Peru, Tanzania, South Africa and Samoa. Certification programmes for sustainable tourism are following this trend, with certification becoming available for countries and regions. For example, the Green Destinations Standard measures, monitors and improves the sustainability of destinations. Join forces with different tourism stakeholders in your country and/or region to strengthen your position as a sustainable tourism destination. For more information on sustainable tourism certification for destinations, see the GSTC-Recognised Standards for Destinations. The tourism industry is performing strongly, also in developing countries. Of all international tourist arrivals in 2030, 57% will be in emerging economies, compared to 45% in 2015. This figure is a considerable increase, for which tourism destinations need to be prepared. To protect and preserve your local environment and community, you need to focus on the sustainable development of your destination. This fact also helps to ensure a steady long-term income from tourism for your community. For more information on sustainable tourism development in developing countries, see the Sustainable Tourism for Development Guidebook. For more general information, see our study of market trends for European tourism. 5 . Which requirements should sustainable tourism comply with to be allowed on the European market? For general tourism requirements, see our study of which requirements your services should comply with to attract European tourists. In addition, there are five pillars that reflect the key principles of sustainable tourism (Figure 1) based on a UNWTO methodology. These pillars also form the main sustainability requirements of European tour operators that focus on sustainability. A clear sustainability policy is essential to develop sustainable tourism. It is the central requirement of European tour operators to which all other requirements relate. European tour operators require you to have your own policy committed to sustainability, which you implement effectively. Develop a company sustainability policy; the more detailed, the better. The main themes that you should address in this policy are social practices (working conditions, poverty reduction, social inclusion, child protection, animal welfare) and environmental practices (energy use, water consumption, waste water management). Some guidelines that can help to establish a sustainability policy include GSTC’s Global Sustainable Tourism Criteria, the Rainforest Alliance’s Guide for Sustainable Tourism Best Practices and UNEP’s Guide to Making Tourism More Sustainable. Also check the websites of tour operators in your target source markets within Europe for their own sustainability policy. This aspect often includes supplier requirements that can serve as a basis for your own sustainability policy. Make sure that you actually implement the sustainable practices which you describe in your sustainability policy. Teach your staff the principles of sustainable tourism and show them how you are going to apply these principles. Share your policy and sustainable best practices with potential partners and customers; for example, through your website. Join forces with governments, tourism boards, tourism associations and other tourism businesses. Together, you can develop or improve national and international policies, strategies or plans for sustainable tourism. Tourism is a labour-intensive industry, but working conditions in the sector can be poor; for example, because of irregular working hours, low pay, low job security, a lack of social security, unhealthy working conditions, or vulnerability to discrimination and exploitation. As a result, sound policies on employment and human resources are an important requirement for European tour operators. Provide decent working conditions and include your working conditions in your sustainability policy. You can use the labour standards of the International Labour Organisation as a guideline. Consider offering additional benefits such as language training, insurance and bonus arrangements. This approach will also increase staff loyalty at your company. Tourism presents opportunities to benefit poor people, including groups that may be disadvantaged; for example, women, ethnic minorities, disabled people, older citizens and young people. In fact, achieving a significant reduction in poverty is a major objective of sustainable tourism. European tour operators want to see local people benefit from tourism. Show how your tourism product benefits the local community; for example, by hiring local staff, using local products and services, as well as promoting other local products, services and activities. You can also encourage your customers to provide voluntary support for local community projects. Lead by example and dedicate some of your profits to such a project. Tourism largely depends on the appeal of unspoilt landscapes and accessible local heritage, especially in developing countries. Beautiful landscapes, rich biodiversity, unique heritage sites and indigenous cultures are often the main reasons why travellers visit. This fact makes the conservation of these assets another important sustainability requirement for European tour operators. They look for suppliers that have policies and take actions to conserve natural and cultural assets. Minimise the impact of tourism on natural and cultural resources, both in your existing product range and when developing new tourism products. Reduce energy consumption; for example, by using energy-efficient lights, solar power, timing devices, motion detectors or automatic air-conditioning control. Minimise water consumption; for example, by encouraging guests to reuse towels and bed linen, regularly checking for leakages, installing water-saving devices or using rain water for irrigation. Efficiently manage waste; for example, by appropriately disposing of waste water, using environmentally friendly cleaning material, separating waste, reducing and reusing paper consumption, or recycling. Sustainable tourism products and services also need to be competitive. They have to satisfy the requirements of European buyers while complying with sustainable practices. In addition, they have to be of good and consistent quality. A lack of consistency affects competitiveness, a problem that experts often encounter among companies in developing countries. Research competitors to see how they position themselves on sustainability. You can use Green Destinations’ Sustainable Destinations Top 100 to select relevant competitors. Also use the Travel and Tourism Competitiveness Index to compare your country’s sustainability performance with competing destinations. For example, Rwanda is one of the few developing countries that scores high on environmental sustainability. Invest in marketing, as this aspect is vital to your competitiveness. Try to establish or join regional cooperation in marketing campaigns. Quality management can be an important tool for understanding tour operators’ and travellers’ needs and requirements, as well as checking whether they are being met. For example, use visitor surveys and feedback from employees, tour operators and journalists. Improve the quality and sustainability of your tourism product based on their comments. 6 . What competition do you face on the European market for sustainable tourism? The barriers to enter the sustainable tourism market are relatively high, as requirements are stricter than for general tourism. However, once you have entered the market, competition is less fierce. As a sustainable supplier, you have a competitive advantage and stand out from other tourism companies. This position also increases your negotiating power. Become a sustainable supplier. Although this requirement may be challenging initially, you will eventually benefit as you reduce your competition. For more general information, see our study of what competition you face on the European market for outbound tourism. 7 . Through which channels can you get your sustainable tourism products on the European market? European tour operators specialised in sustainable tourism or in your destination offer the best opportunities. Sustainability requirements of specialised tour operators generally go deeper than those of large tour operators. You should target the type of tour operator that best matches your product. If you offer eco lodges, for example, focus on tour operators specialised in nature tourism or ecotourism; or, if you offer community stays or activities with local communities, focus on tour operators specialised in community-based tourism. You can identify them via trade associations, events and databases. World Travel Market – annual tourism trade fair, November, London. To increase your chances of direct sales, you can promote your product on sustainable, green or ecotourism tourism websites/portals. For a general overview of the trade structure for tourism, see our study of Channels and segments of the European tourism market. 8 . What are the end-market prices for sustainable tourism products? the price of goods and services that the traveller consumes in the destination country. Check which countries have cheap direct flights to your destination; for instance, at Skyscanner. This availability gives you a competitive advantage in those countries. You can compare prices for sustainable travel products online; for example, at Responsible Travel. Be transparent in your pricing and explain for which sustainable goals you use a part of your profits or extra commissions; for example, the maintenance of national parks, or the construction of a community school. Tourism Boost has some useful online tools for pricing tours and accommodation. These tools help you to determine the break-even point and the ideal retail price of your tourism product.